Welcome to The Forest Witch's shop where you'll find many teas and paintings inspired by Gods and mythology, and stories from books, shows, movies and video games! Let your nerd bone be tickled! This tea quickly became one of my absolute favorites! It tastes just like a yummy citrus cake in tea form! Softens right up with a little milk/honey but really doesnt need any!! Looking forward to trying more teas from this seller! Got this as a birthday present for a friend, they loved it. What's this? Now you can buy a huge amount of tea?! Yes indeed! Buy up to 120 servings! My regular bags are just 20 servings. And, get a discount on the biggest options! 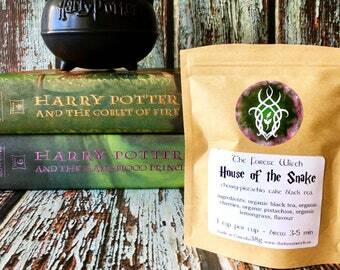 The Forest Witch shop began as a little bit of magic whilst Mia sipped away, imagining delicious tea blends to drink while reading, and wondering if she could make them herself. On a lovely October day, she decided to take that leap and buy her first ingredients, a handful of different types of teas, and plenty of tasty herbs and spices to begin with. As the months passed, and her offerings grew, Mia realized what a fantastic thing she got to do, and always looked for inspiration for her next blend, whether it is the Gods and mythology from ancient times, or characters and foods from fantastical novels to wonderful shows, movies, and even video games. 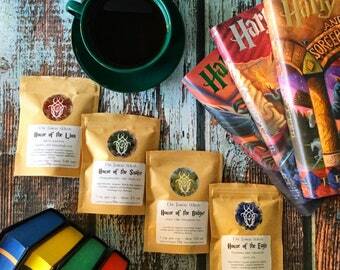 So many stories to be consumed, to be loved and geeked out about, and so many teas to be inspired by them! A few years later, as her need to bring beauty into the world continued boiling over, Mia decided to begin offering prints of her original paintings as well! 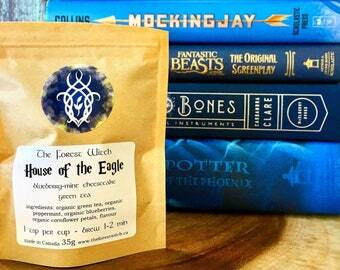 Same as her teas, she's inspired by mythology, stories from books, tv shows, movies, and general nerdery. Please stick around, because The Forest Witch is going to continue writing this story for some time yet! Canvas Canada manufactures prints of my artwork, and then ships them to the customer. 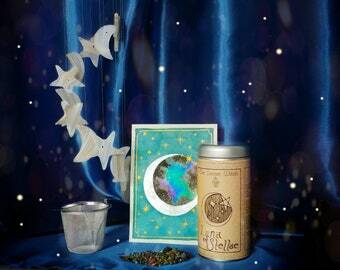 All sales on tea are final and will not be refunded by the seller once items are shipped. Refunds are available for prints, however, the buyer will cover the costs of return shipping. If you as the buyer have a mistake in your order, please contact the seller BEFORE anything is shipped in order to switch out teas or attain a refund if you as the buyer have changed your mind about the purchase. Once an order has been sent in the mail, the seller is not responsible for damages or losses. The buyer is responsible for making sure that place of delivery is safe. If you think that your items may get stolen sitting in your mailbox, call your post office and have them hold the item until you can pick it up in person at the post office. All payments must be secured before anything is sent to you. 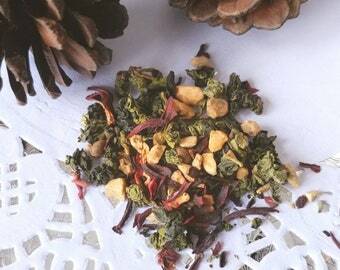 If you have made a mistake concerning an order and I have not yet shipped, contact me as soon as possible to sort out the problem, whether you no longer want the teas, or want to switch the blends you're ordering. If you've made a mistake regarding your art print order, please message me within 24 hours so that I can modify what you would like. I am now offering tracking on orders sent within Canada and the USA. International tracking won't be offered as some countries do not have the capabilities to track shipments, so I'd rather not have you pay for a service you won't receive. Once your order is in the mail, I, the seller, am not responsible for any duties or taxes incurred at borders. Nor am I responsible for any losses or damages. Prints are manufactured by Canvas Canada, in St. John's, Newfoundland. They are currently only able to be shipped to Canada & the US. I will place an order with Canvas Canada for your prints about a day after you place your order. That way, if there are any mistakes in the order, you have time to fix them. After an order is placed, I am unable to cancel or edit it. All prints come with tracking so that you can follow their journey to your door. Print order fulfilment can take between 5-8 business days, then shipping time for Canada is between 4-8 business days. US is 5-8 business days. Currently, however, I do not store or process your information using any hosting service. For purposes of EU data protection law, I, Melissa Arsenault, am the data controller of your personal information. If you have any questions or concerns, you may contact me at theforestwitch [!at] live.com. Tea can stay safe to drink for quite a long time! In fact, other than nutrients decaying over time, so long as it still smells and tastes good, it's perfectly fine to drink! However, if you do want to make sure that you're getting all those awesome nutrients, it's agreed upon that about a year will be what to aim for. Of course, to lengthen that time, you can keep your tea in the freezer! Thankfully, all my tea is made fresh, and packaged in resealable bags! I also like to keep my ingredients as fresh as possible, so I make orders for the ingredients for as much as I would need to make tea in a month, so your bags of tea will be pretty darn fresh when you get them! Why are some of your teas not listed anymore? Just as in any business, some products do better than others, and the ones that don't do overly well get set aside here. However, you can find all of my teas on my website, unless I am completely discontinuing the blend. Also, I do sell seasonal teas, so you'll likely see those ones again the next time the proper season rolls around! Can you make a special tea for me? I certainly can! And it can be for just about anything, from specific deities to a tea inspired by your favourite character from any kind of story medium (book, tv, film, fairy tale). If it's something I can sell in the shop afterward, you need only buy a single bag. If it is something very specific that wouldn't be able to sell widely, then you'll be required to buy the batch, however many bags that is (usually between 2-4 depending on ingredients). Do you sell large quantities of tea? 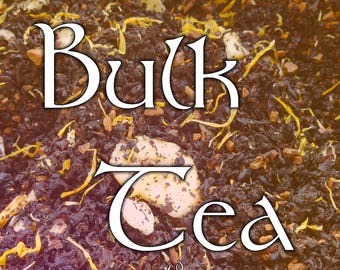 I offer discounted bulk bags of individual teas, as well as discounted packs of either 4, 8, or 12 teas of your choice. If you need more tea, say as wedding favours and the like, please message me and we can discuss what you need and what kind of pricing I can offer! I also have a wholesale sheet available for those interested.